Peter Hickman on the Smiths BMW at Milntown in Monday's Superstock TT. Peter Hickman won his maiden Isle of Man TT race as he smashed the lap record on his way to glory in the Royal London 360 Superstock race on Monday. The Smiths BMW rider prevailed in an incredible race, with Hickman finding himself in ninth place at Glen Helen on the opening lap following a mistake on the brakes at Braddan. Michael Dunlop finished as the runner-up on his MD Racing BMW in the Superstock TT. However, the British Superbike rider mounted a stunning comeback on the S1000RR and after lapping at 132.087mph on lap one despite his mistake, Hickman then shattered Ian Hutchinson’s lap record with a speed of 134.077mph on lap two. It was the first ever 134mph lap by a Superstock machine and the first in the class in under 17 minutes. It got even better for Hickman on the fourth and final lap as he raised the record to a staggering 134.403mph, which was close to Dean Harrison’s new outright lap record, set during the RST Superbike race on Saturday. He also smashed the previous race record by 57.5s, completing the four-lap distance in 1h 08m 49.976s. Michael Dunlop (MD Racing BMW), who won the earlier Supersport race, finished in second place, 4.4 seconds behind, with Harrison taking third on the Silicone Engineering Kawasaki. All three riders completed the final lap in under 17 minutes. In one of the most exciting races of recent years at the TT, it was Harrison who seized the initiative, moving into a lead of 5.3 seconds at the Bungalow on the first lap from Dunlop, with Hickman powering through to third after his braking error at Braddan, 5.3 seconds behind Dunlop. Dean Harrison at the Gooseneck in the Superstock TT race on the Silicone Engineering Kawasaki. At Ballaugh on lap two, Hickman had moved up to second place, four seconds behind Harrison, with Dunlop only 0.8 seconds further adrift in third. With Hickman on lap record pace, Harrison’s lead was down to 2.4 seconds at Ramsey and Hickman made further inroads over the Mountain, closing the gap to 1.2 seconds at the end of lap two with that blistering 134mph lap as the riders came in for their pit stops. Dunlop was third, 2.7 seconds back on Hickman, but it was all change after the fuelling stop with Dunlop moving into the lead by half-a-second at Glen Helen over Harrison, with Hickman 0.7 seconds in arrears. David Johnson came through to fourth on the Gulf BMW ahead of James Hillier (JG Speedfit Kawasaki), with Bathams BMW rider Michael Rutter dropping a few places from fourth to sixth. At Ramsey, Hickman regained the advantage by 0.8 seconds from Dunlop, who had 1.7 seconds in hand over Harrison. As the race built to a crescendo, Hickman’s cushion was only half-a-second over Dunlop as they began their fourth and final lap, with Harrison now 4.8 seconds further behind. Hickman put the hammer down and led by 1.3 seconds at Glen Helen, but Dunlop pulled some time back on the run to Ballaugh, closing the deficit to 1.1 seconds, with Harrison also making up time to lie 3.4 seconds behind Dunlop. 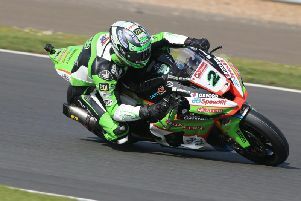 At Ramsey Hairpin, Hickman’s advantage was only 0.146 seconds over Dunlop, but he extended his lead to two seconds at the Bungalow and finished strongly, breaking Harrison’s sector record from Ramsey to the Bungalow, which the Kawasaki rider achieved on Saturday in the Superbike race. Hickman’s new lap record of 134.403mph was enough to secure a popular victory by 4.4 seconds from Dunlop, with Harrison 9.1 seconds down in third. Aussie Johnson was 1m 12.758 seconds behind the winner in fourth, holding off Hillier by 4.9 seconds with Rutter completing the to p six. Martin Jessopp finished seventh on the Riders Motorcycles BMW, ahead of Sam West, with Ivan Lintin in ninth. Newcomer Davey Todd showed his potential as he finished tenth on the Burrows Engineering Racing Suzuki. The 22-year-old became the second fastest newcomer in history behind Hickman with a lap of 127.890mph on lap two. Brian McCormack was 12th while Shaun Anderson finished 15th on his Suzuki. Skerries man Michael Sweeney finished in 19th on the MJR BMW. Lee Johnston, Gary Johnson, Ian Hutchinson, Conor Cummins and Derek Sheils were among the retirements.